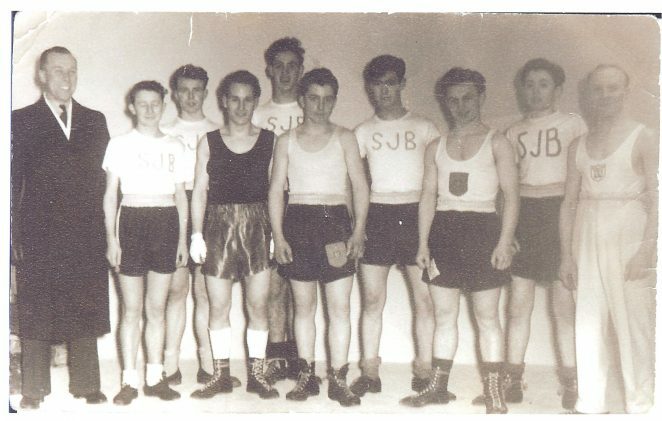 The Saint John the Baptist ATC Boxing Team 1953. Over two years this team produced five ATC Champions of Great Britain. Front row: Malone: Waller: Broadway: Trangmar: Brasil. I remember seeing a great fight between Bernie Trangmar and Terry Tulley at The Crown and Anchor, when the M.C. my dad, Henry (Dapper) Thwaites gave the wrong result and the two boxers had to be called back from the dressing room to the ring, for my very embarrassed dad to correct his mistake. I still think I won that fight – your dad was right the first time.